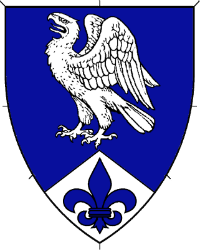 Azure, an eagle rising and on a point pointed argent a fleur-de-lys azure. Name registered with the College of Arms in August 2017. Device registered with the College of Arms in August 2017.